It is busy time of year for many of us. Had hands full with christmas ornaments but wasn’t stopped making-creating something new. I just loooooove making dolls! BB Candy dolls that would like to share with you today, took me the longest time to create from any other doll made so far. It is not doll to be made within few hours. And those that will try will see themselves. When picture of this doll popped out in my head, didn’t sleep until the doll was not done. I am more than happy with the final outcome and am really proud to share them with you. Here is a little photo of three of them finished so far (have several more I am working on-making clothes take time to design and create)! Doll in the middle is little different. She is made in fine thread instead of yarn and is completely different stitch count from the other two dolls and the pattern I will share with you today. 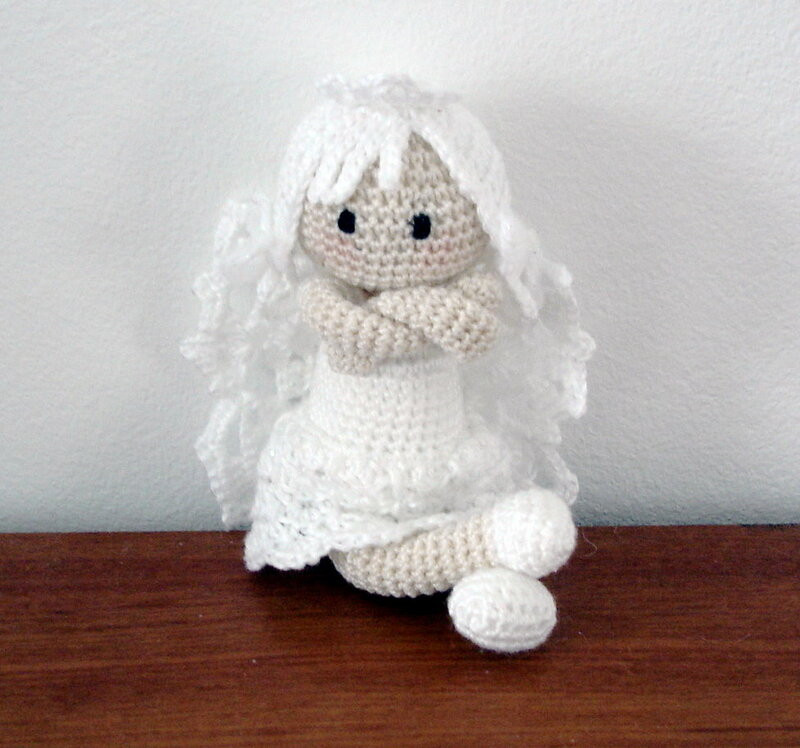 She is my first “lace doll” and such dolls will go to my shop. She is in the photo because the shape of the body is very similar to ones on sides, and cloths fits all dolls the same way. Like mentioned earlier, pattern that am sharing with you today, requires a little bit more work than BB Dolls or miniature Karla doll. 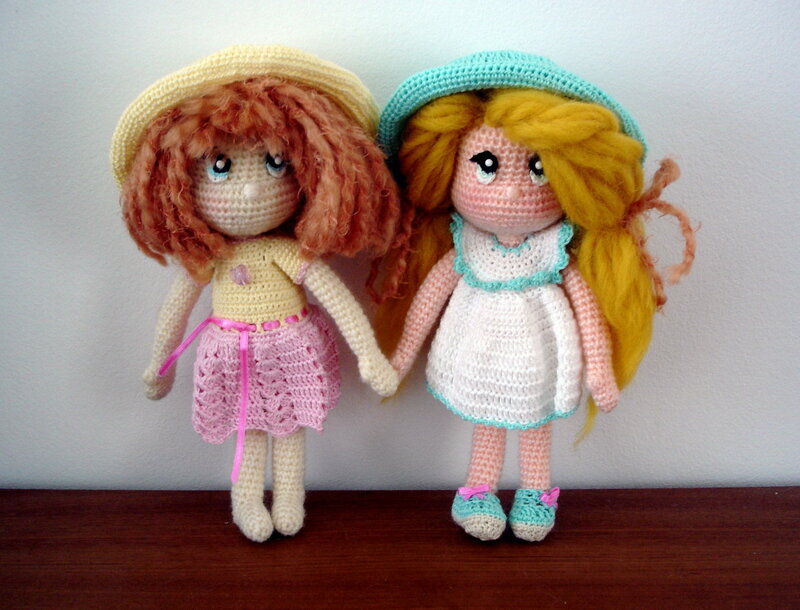 These dolls are 21-22 cm tall and are more doll companions, treasure dolls than one to stick in the bag and carry around. At least I feel for them this way. They are really darlings and whoever will try making one will understand what I’m talking about now. Will give you two different options to make a doll. One with all five fingers on, or fingerless doll that is for the most, easier way to work. Here is the photo of two unfinished dolls that are made with fingerless arms. 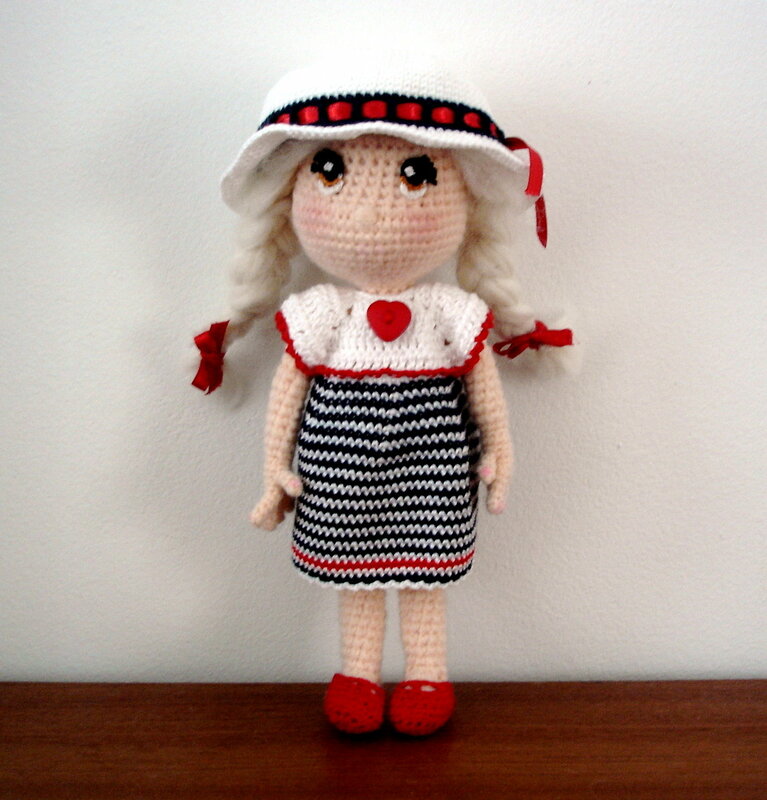 Fingerless dolls are made in DK, No.3 yarn weight, or light weight. These particular two were made in RedHeart FinaDK (100% New wool), with 2,5 mm hook. 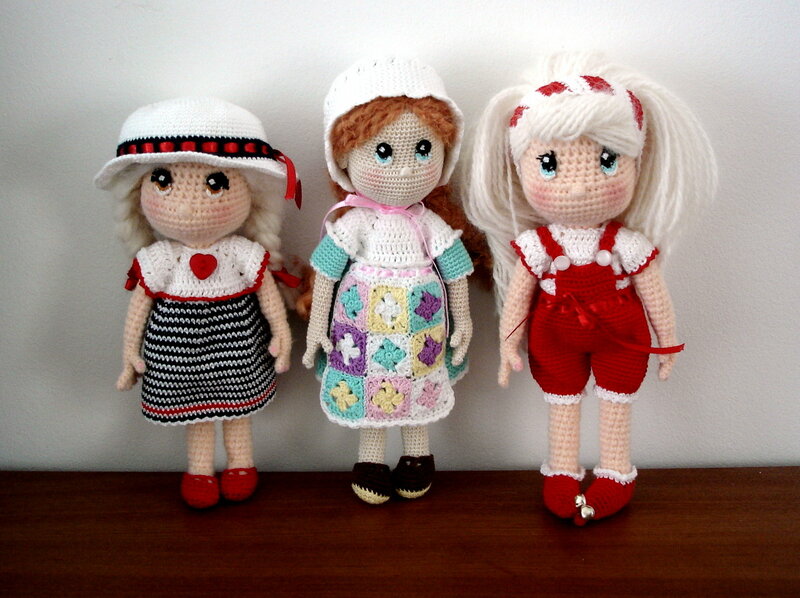 Dolls you have seen on group photo (side ones), Summer girl and Holiday one, were made in Lace type of yarn. Made them using SchachenmayrSMC Suavel in very light peach. Head and body were made with two strands of yarn and 2,5 mm hook, while the fingers and hand were done with just one strand and 1,75 mm hook (arm was then continued and worked with two strands and 2,5 hook). One more photo of Holiday Doll and let us move to pattern. No.0 or No.3 yarn of your choice for the dolls head and body. If something is missed and you have problems reading the pattern, feel free to write and ask; will be glad to help. Stuff the head nice and firm. Take your time stuffing the head so it remains with nice shape. Stuff the foot nice and firm. Continue stuffing the legs as you go (don’t stuff to hard). Finish stuffing the body. Will add more stuffing when sewing head and body parts together. R1 (of hand making) With little finger as working one, continue joining other fingers. We can make hair and eyes in order to finish doll completely and prepare her for dressing up. On this blog you will find all different kinds of wig making. For now it is best I can offer, and Beth Webber is wonderful doll designer. cut all threads to 5 mm length and glue them on the back of the eye. Let it all dry. You can glue the eyes on the face or you can sew them on with floss thread (so called invisible thread). If you like to add eyelashes, cut six pieces of black thread of about 2 cm long, and wave them to three sided loops on each eye (black part). glue the back of loops so eye lashes don’t fall out when cut short. Once dried, cut the eyelashes to 2-3 mm length and curl hem towards forward, over eye. I added white eye sparks with textile paint (because the eyes were very tiny and hard, difficult to sew white over the black). You can always use safety eyes, or you can paint the eyes. Place them right after R14 leaving at least 4-5 stitches between them. Nose is sewed on (embroidered) with same yarn dolls head and body was worked with. Embroider it in the middle of R14 and R15. Use some powder blush to make cheeks rosy. If you like you can add lips embroidering them as well. Will give you details on how to make Holiday outfit (Elf doll you can see in the photo as well as how to make a dress out of the shirt she is wearing). Will try to add more clothes these days. Hats, shoes, different dresses…. Use bow at this row. Tie it in front. Sl st to the 12th stitch from the last one stitched of the front upper part made. (count to your left) We are making straps here, starting them from back. Now count 13 sts on the other side of the first row front upper part made (count to your right). note: V stitch indicated in the pattern you will make: 2dc-ch-2dc in one stitch, or under the chain in every row after 1st one. basic top is done here! Continue repeating R5 for desired length. After done, sc all around shirt making holes for buttons on one sides edge. Do this simple way, as shown in the overalls example. work in rows for at least 1 cm length (for easier clothing the doll later). After this 1cm is finished, connect ends and continue working in rounds. After R6 is made, you can decide if will work in single crochet, double, or use any other pattern of your choice. Same way decide of the length of the dress you will make. With this pattern tried to show you the basic square start when making dresses or shirts. Soon will show you how to start with round shape around neck and make shrt-dress different way. R20 ch1, turn, sc7 – fold the end of slipper you are currently working on in half. Skip one stitch and sc7 over two opposite stitches (of the same row). One reached desired length, connect beginning and end row to form a band. And that is all for now. 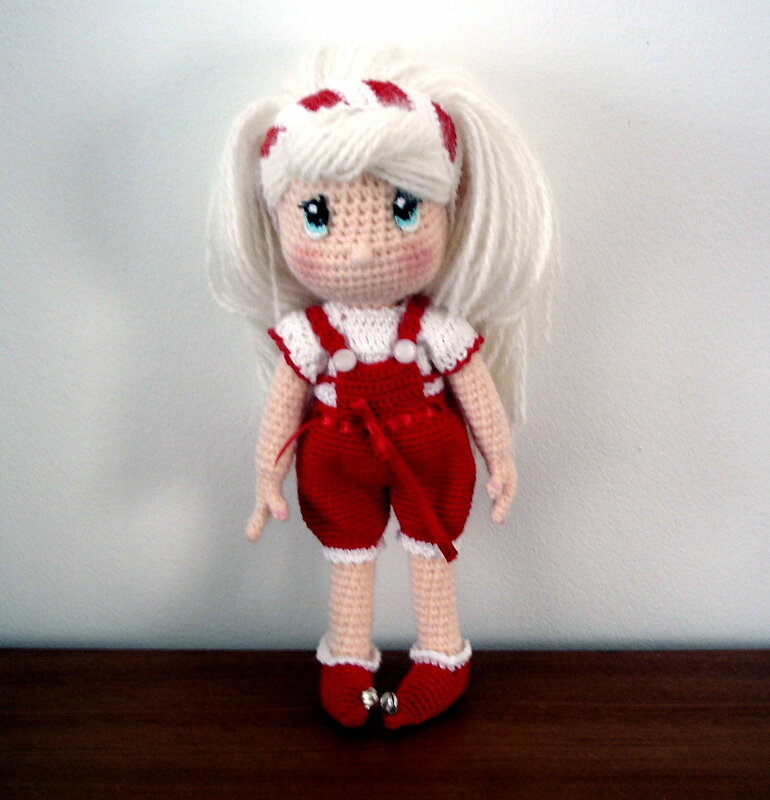 I hope you like my new Candy dolls design. Hope you will enjoy making them as well. For any questions you might have, or any mistakes in the pattern you might find, please let me know so can help you or make corrections immediately. One last photo before we finish for today is…. Wishing you all wonderful Friday and blessed weekend full of fun and joy! I love these little people. How much joy you must feel as each comes to life in your hands. Bless you for sharing the patterns. I know you enjoy your labors. I can read it in your comments. thank you so much for this cute pattern. I really fell in love with your candy dolls as I saw them. 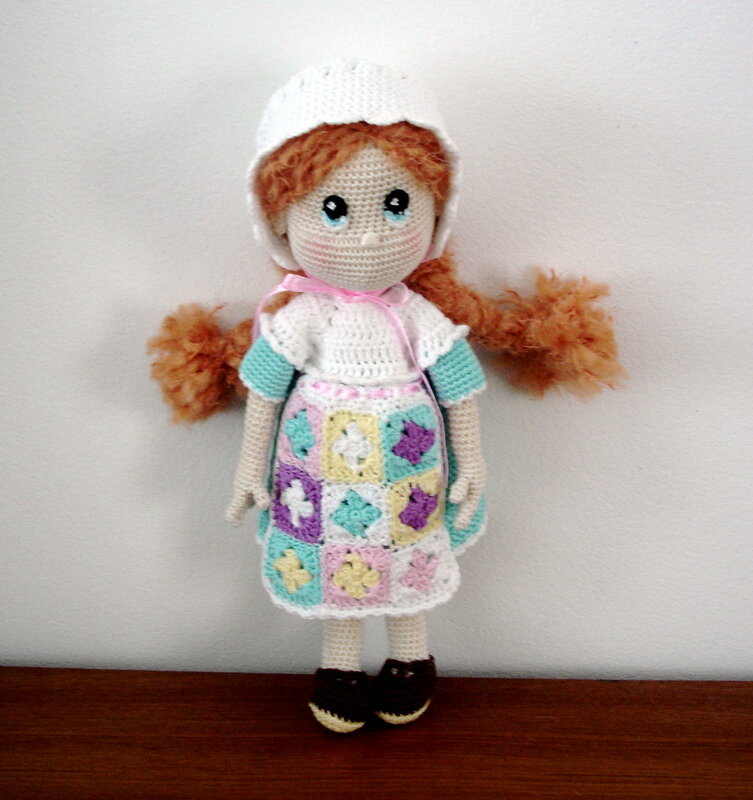 Searched the Internet for days to find a doll that touches my heart 🙂 I just took my yarn and started to make one for my little niece for easter. Maybe you have any tipps for me concerning this part, If you have any time left, I’d really appreciate that! Thank you so much! For the feet, try looking this tutorial I made for Smurfs. Feet on Candy Dolls are done very similar way, and this will help you understand. if you’ll still have trouble, let me know and I will try to find other solutions to help you out.